In this 2008 novel by Pulitzer-prize winning author Geraldine Brooks, we are invited to view a fictionalized history of the Sarajevo Haggadah. For those who don’t know, a Haggadah is a Jewish religious text used to oversee the Passover seder. Here, Ms. Brooks dreams up a fictionalized journey for one of the more famous editions. Australian antique manuscript expert Hanna Heath is called by the UN to catalogue and conserve the newly resurfaced 15th century text. This Haggadah is different than most, in that it’s intricately illustrated and is one of the oldest known copies in existence. As Hanna carefully unlocks the mysteries the book holds, she finds a series of artifacts (part of a butterfly’s wing, a white hair, a red stain) that gives her clues to the book’s incredible journey. Interspersed with Hanna’s story are flashbacks that give the reader insights into how the artifacts link to those who created and cherished the book throughout history. The physical evidence takes us from 15th century Spain, to 17th century Venice, to the 1990s and although the evidence itself is fascinating, it’s truly the “people of the book” that Ms. Brooks highlights. As we trace the book’s path, we relive the struggles of the Jewish people across time and space. I admit I was far more interested in the physical artifacts than in the stories (just a personal preference) but the stories are undeniably moving and the book serves as the bridge to link these disparate groups together. If you are like me and don’t read much in the way of eastern European history, this book is really eye opening. Thoroughly enjoyed it. 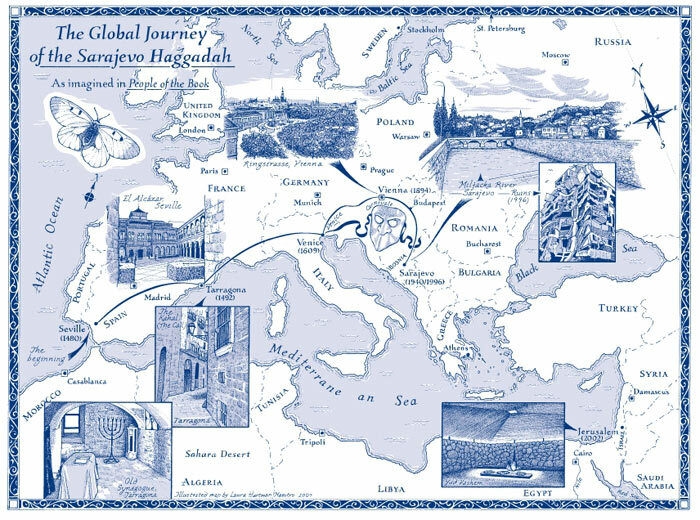 Look here for a neat map that shows the journey of the fictional Sarajevo Haggadah.